A great article on our Artisan home Tour model from this past June. An amazing home! This is a home you need to see! A departure from what we’re normally building. Mountain Modern architecture, stone, steel, reclaimed barn wood, flat roofing. 8700 sq. ft, 5 bedrooms, 7 bathrooms, pool, custom glass and steel elevator, and so many other amazing features. Come check it out August 10-12, 17-19, 12:00 – 6:00 PM. NFL Alumni Home tour – Get your tickets soon! Spectacular Artisan Homes and NFL Alumni! 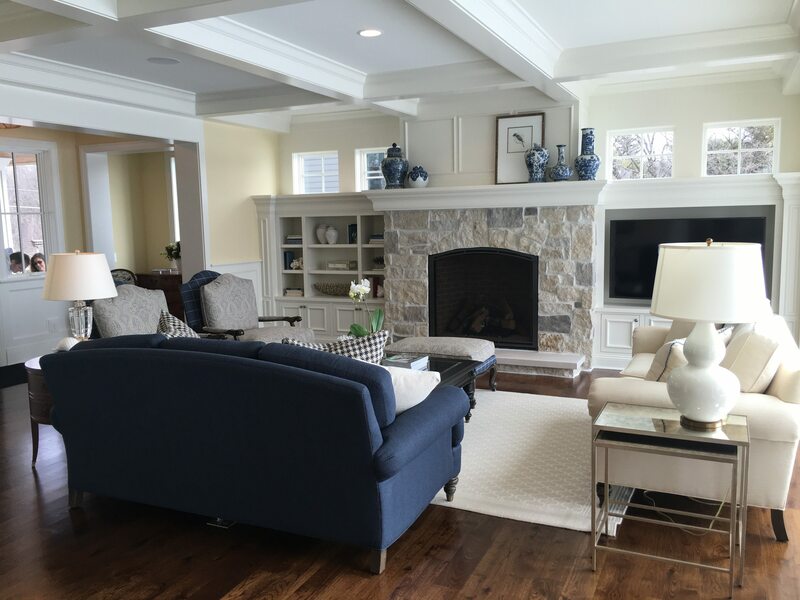 The Builders Association of the Twin Cities-Housing First Minnesota, producer of the Artisan Home Tour by Parade of Homes, and the NFL Alumni Association have partnered together to present the NFL Alumni Artisan Home Tour. 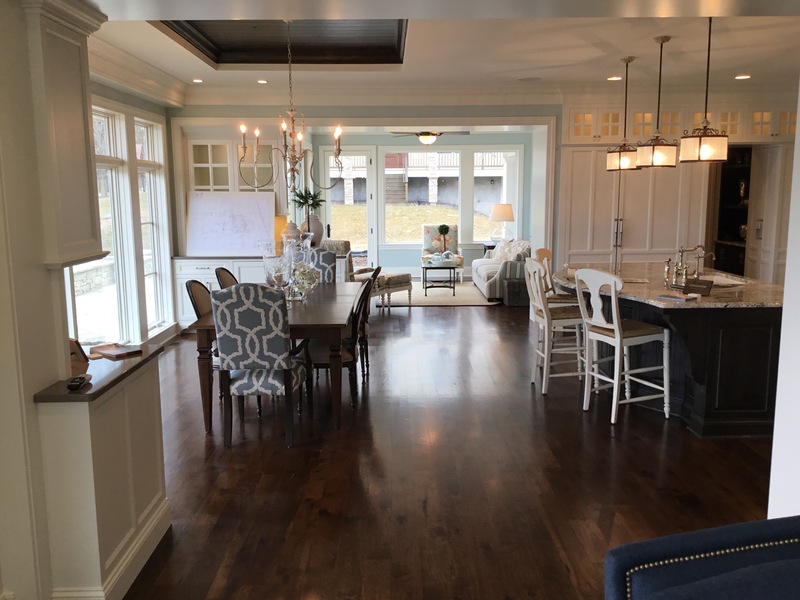 Spend Saturday morning of Super Bowl weekend riding in a luxury motor coach to tour four amazing high-end residences located in the western Twin Cities suburbs (see below). Then be transported to a special lunch and reception hosted by NFL Alumni at the historic Lafayette Club in Minnetonka Beach! Tickets are limited! Proceeds benefit the BATC Foundation and NFL Alumni. Vote for Stonewood – Best of Lake Minnetonka! CLICK HERE TO VOTE for Stonewood ! The 2018 Best of Lake Minnetonka survey is here! Don’t miss your chance to vote for Stonewood! The results of our annual readers’ choice survey will be printed in May, in our special Best of Lake Minnetonka edition of Lake Minnetonka Magazine, and we’ll need your help to fill it with the best Lake minnetonka has to offer. 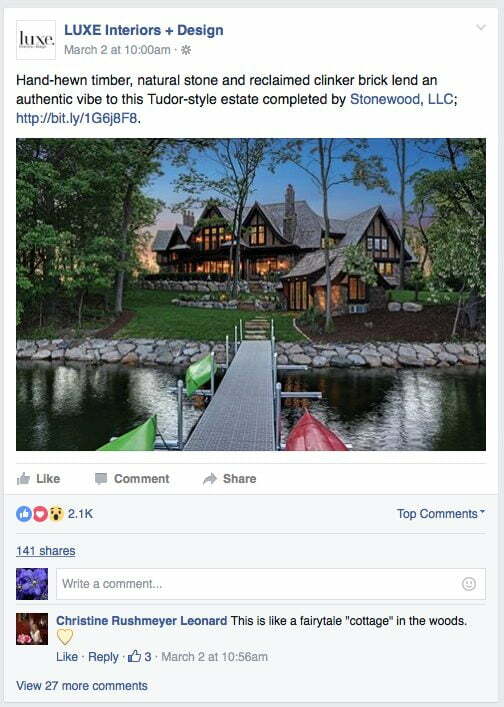 (The results will also be posted here at lakeminnetonkamag.com on May 1). Amazing lot available on North Arm Bay. As featured on Houzz.com this week…. Houzz Contributor. Arts journalist specializing in design and architecture. 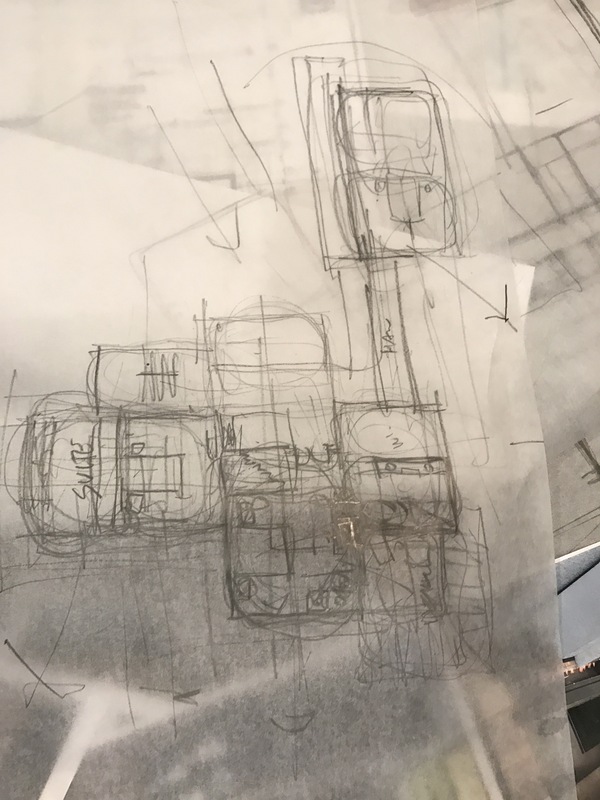 Sven Gustafson and his wife were searching for land on Lake Minnetonka to build their new family home when they found an ideal site with a small teardown house, but it was the boathouse that clinched the deal. Though it was decrepit to the point of almost falling into the lake, the boathouse and its location meant the structure could be rebuilt right on the edge of the lake without having to get new and expensive permits. The home site is higher up the hill from the boathouse, with commanding views of the lake. The newly built cottage-style Craftsman home is clad in cedar-shake siding, with limestone accents, zinc roofing and zinc half-round gutters. The house is heated and cooled via a geothermal well field. Inside the home, chic contemporary details abound. The front door is oak painted black. All of the window frames were painted black for a contemporary feel. The floors are rift and quartersawn white oak. The staircase to the left of the front door leads to the lower level; the stairway to the right leads up to the second level. In the living room, which overlooks Lake Minnetonka, barn beams from Manomin Resawn Timbers add a rustic touch. The fireplace has a stone surround of pillowed limestone. The painting above the fireplace was created specifically for that spot by an artist from Madeline Island, Wisconsin. In the dining room, a custom wall of wine is made with black walnut racking, steel and doors resembling warehouse windows. On the opposite side of the 12-foot-long custom zinc table are three custom steel doors that open to a family room and deck. The kitchen and dining room flow seamlessly together. The farmhouse sink was a must, Gustafson says. A stack of Marvin windows over the sink were “mulled together and painted to resemble steel-framed windows.” The cabinetry is white oak. The countertops are Carrera marble. The sunroom has a wood-burning fireplace featuring the same Snow Trail limestone used on the home’s exterior. 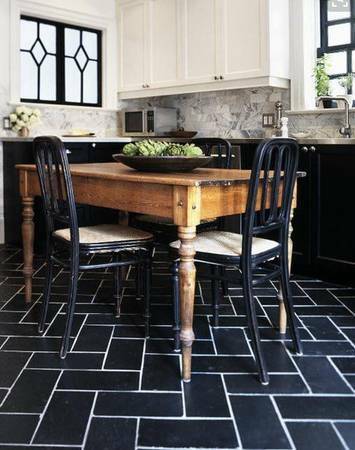 On the floor are handmade cement tiles that Gustafson’s wife designed and had made in Vietnam. A Marvin bifolding door opens the sunroom to the outdoors. In the master bedroom, the iron bed is a custom design featuring a gunmetal finish. Gustafson’s wife found the gray-blue antique cabinets and repurposed them to frame a flat-screen TV and store media equipment. In the master bathroom, a soaking tub sits on a floor of Carrara marble, which also provides the threshold for the glass shower. The cabinetry is white oak. The home also includes an 800-square-foot studio for Gustafson’s wife, who is an artist and graphic designer. The floor is Centiva vinyl that resembles wood. Outside the studio she can relax on her own private patio. The boathouse that inspired the project was renovated and updated with all of today’s modern comforts. “It’s like a little living room on the water,” Gustafson says. 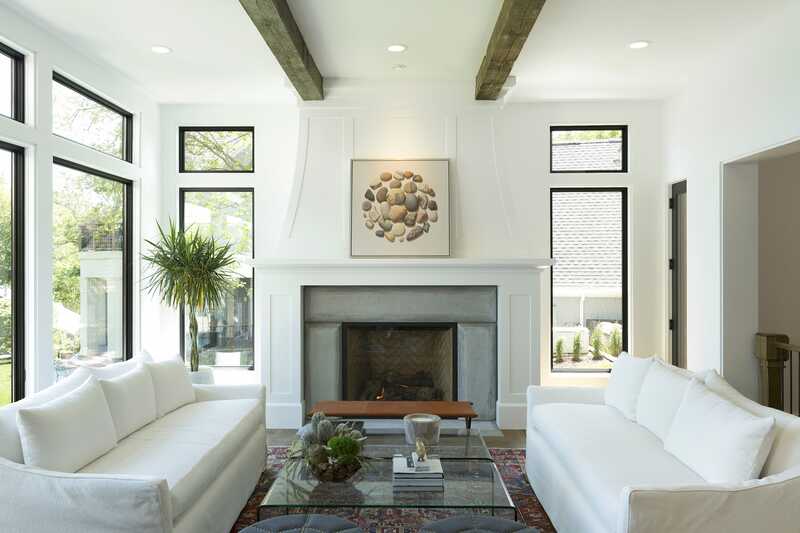 Designed by Kathryn Alexander of Alexander Design Group, this is a home that embodies the character and charm of an authentic Lake Minnetonka lake home – true to it’s setting. Nearly 300′ of lakeshore on Tanager bay, connected to the larger lake, and nearly 3 and a half wooded acres. 5 bedrooms, tons of entertain space, pool… This homesite is available, and construction can begin spring 2018. Call for more info! In conjunction with Peterson Keller Architecture, we’ve developed a modern concept for Tanager Estates. Set on over 3 and a half acres, 350′ of lakeshore, this home takes full advantage of the amazing views. A quiet setting in a new 3 home development. Tanager lake connects to the larger lake near North Shore marina. 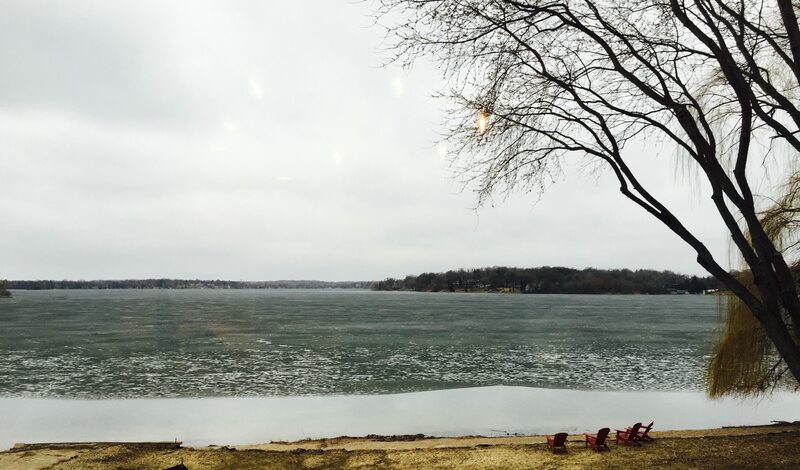 We’re excited to be building another mountain modern home on Lake Minnetonka. This one is located on Maxwell bay and will be featured as one of our 2 Artisan home tour homes in June 2018. The exterior is a mixture of reclaimed barnwood, stone & corten steel. We’ll be posting more photos as construction progresses. Lakeside features a convertible screen porch overlooking a pool. Open steel cage staircase flanking a 3 story glass elevator in the foyer. 2 sided, steel warehouse window wine cellar in the foyer & gathering rooms. And some pretty nice views of the lake…. Sleek architecture, exposed beams, floor to ceiling glass. Plaster finished walls and ceilings…. 6 years ago, Stonewood built a ‘playhouse’ for donation to the Minneapolis institute of art. Designed by Alexander Design Group, and built with donations from many of our trade partners, it’s the only ‘tiny house’ that Stonewood has built to date. It was a nerve-racking 3am drive from our office parking lot to the institute – the first overpass was a bit scary! Stonewood and Revision support a number of projects around Guatemala. Most recently, we’ve funded an addition to the primary school in San Juan la Laguna run by Francisco Perez. The cement is poured (in the rain) and work is nearly complete. The construction techniques, and equipment is just a bit different than on our projects! A beautiful backdrop for the new classroom and patio! Meet America&apos;s Greatest (and Most Inspiring) Entrepreneurs This Year! Revision, LLC, Stonewood&apos;s Remodeling company, named one of Inc. 500 fastest growing companies. Under John Daly&apos;s leadership revision has grown dramatically over the past several years. The fastest-growing private firms in America are creators. They create companies, they create value, and they create jobs–619,631 of them over the last three years. Here, by sector, are the companies whose creativity propelled them to the top of this year&apos;s Inc. 5000–from the chart-topping No. 1 company (mobile-gaming platform Skillz) to No. 5000 SBG Technology Solutions (a technology support provider). You&apos;ll also discover the newest hot spots, the coolest products, and the people who make it all happen. For more than 10 years, Stonewood has been a member of the National Association of Home Builder’s – Premier Builder’s Group. 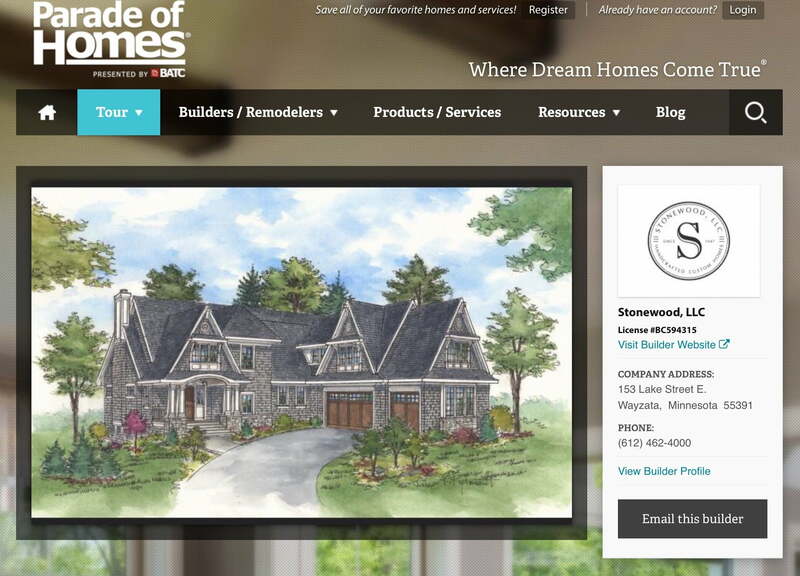 One of less than 20 members that are considered to be top custom homebuilders in their market. All possess a portfolio of architecturally significant, high-end custom homes, have well-developed business and marketing processes & a construction volume of more than four homes per year, but less than 20. Their well staffed businesses are composed of project managers, designers, estimators and architects. In short, the members of the Premier Builder’s Group are builders that will inspire, cause others in the industry to improve their businesses & raise the bar. To be built – by Stonewood. Close in Lake Minnetonka lakeshore build-site, hard/sandy bottom, 60′ lakeshore and almost 1/2 acre. Stunning sunsets with large west facing views over Spring Park Bay. Plenty of room to build your dream home. Here’s a fun aerial shot of a couple of homes on Tonkawa road in Orono on North Arm bay of Lake Minnetonka. From the left, a Mediterranean style home that was featured in the Luxury home tour, then a rustic mountain home also featured in the Luxury home tour, next a hole in the ground that is soon to be a mountain modern home to be completed early summer 2017. That makes makes 11 homes built by Stonewood on North Arm Bay! 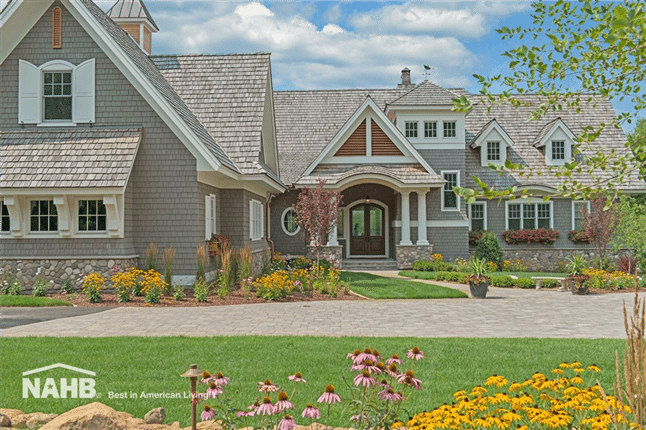 North Arm Retreat, of Orono, Minn., is a Best in American Living Award Platinum winner for One-of-a-Kind Custom or Spec Home 6,001 – 8,000 square feet. It’s also our Home of the Week! The cottage-style Craftsman exterior with cedar-shake siding, rustic, reclaimed barn timbers and handmade cement tiles and countertops add unique architectural accents to this home. Gorgeously crafted warehouse style doors open to a climate-controlled wine room. A Marvin bi-folding door with Phantom Screen opens the sunroom to the outdoors. 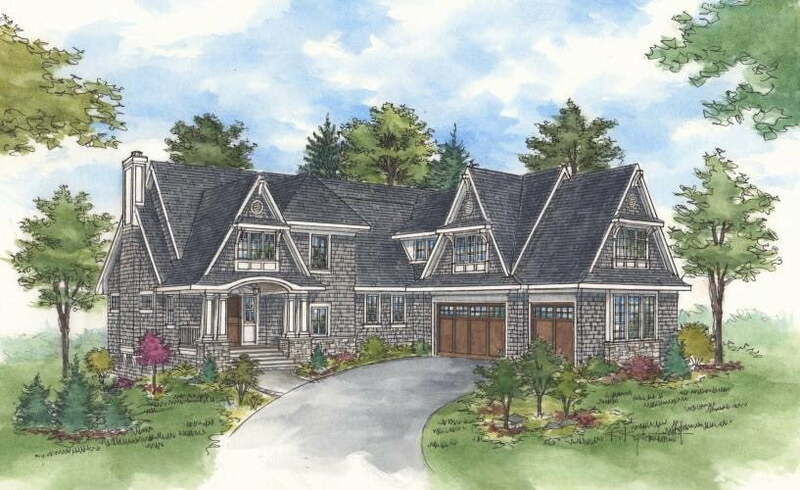 BALA Winner – Best Custom Home 6-8,000 sq. ft.
Best Custom home in the US, 6-8,000 sq. ft. PLATINUM | One-of-a-Kind Custom or Spec Home 6,001 – 8,000 sq. ft.
Design Statement | The cottage-style Craftsman exterior with cedar-shake siding, rustic, reclaimed barn timbers and handmade cement tiles and countertops add unique architectural accents to this home. Gorgeously crafted warehouse style doors open to a climate-controlled wine room. A Marvin bi-folding door with Phantom Screen opens the sunroom to the outdoors. 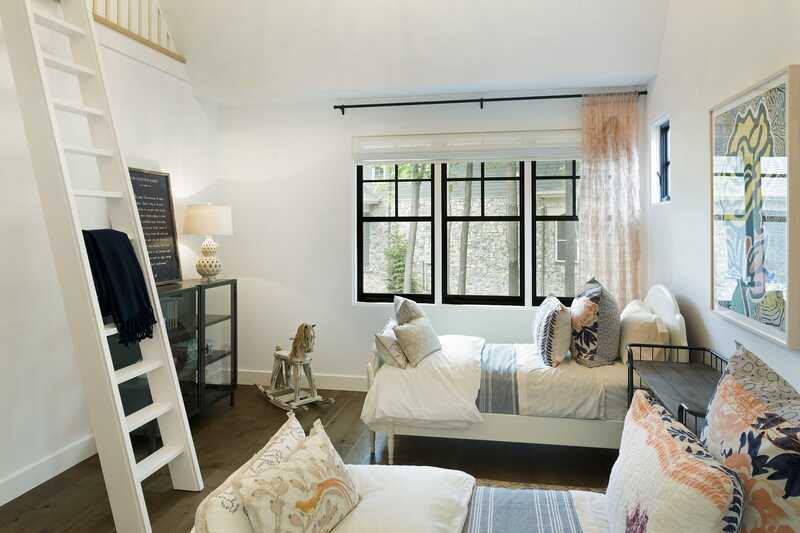 This five-bedroom, six-bath home also features white-oak hardwood floors and lofted ladders in the children’s suites. Other amenities include a 566- square-foot art studio, boathouse with cantilevered deck and a three-car garage. Landscaping on our Artisan home tour model is progressing! 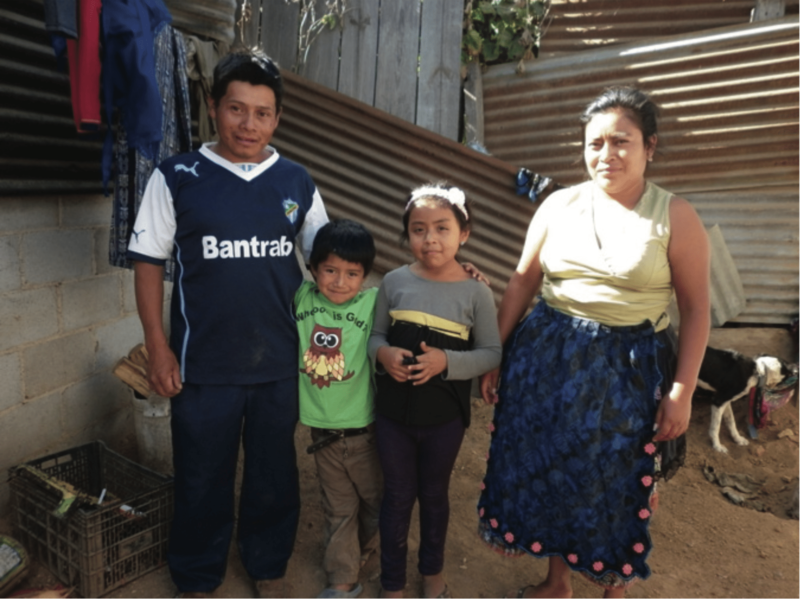 Stonewood’s Newest Homeowner’s (in Guatemala)! Stonewood does a two-for-one, of sorts when we build our homes. For every home we build in Minnesota, we coordinate and fund the construction of a home for a deserving family in Guatemala. We are excited to share with you that of the ten homes that we committed to be built this summer, 5 are now under construction! Following are pictures and details of the families that have been approved so far. Breaking Cycles Ministries, run by our friend Betty Merida, is working to transform lives in the Sumpanago area. This is just the beginning of what we have committed to this year. We’ll post photos of the homes as construction progresses. and mother runs the house and sells in the market. Lives in a single room block stuck with lime and tin roof. and father is a bricklayer’s assistant by profession. and mother runs the house. The mother runs the house. The mother runs the house and sells tortillas. The father drives a bus for a profession. and mother runs the house. We have too much tile! Tile for sale! We didn’t buy too much…. We wanted something really special, so we had the tile custom designed and hand made in Vietnam by artisan’s that have been making tile in this way / style for many years. We’ve got quite a bit, deeply discounted! Beautiful imported cement tiles. The tile is a surplus of tile that will be used in the Stonewood 2016 Luxury Artisan Tour Home. Currently 450 sq feet remain. $55 a box. If you are willing to purchase the entire lot we are willing to negotiate a better price. After the Artisan Tour the price will increase due to the ease of selling it from the tour. (8″ x 8″ x 5/8″) – SOLD in boxes of 12 tiles. 5.3 sf per box. Currently 275 sq feet remain. $48.00 a box/24 tiles. Sold by box only. If you are willing to purchase the entire lot I am willing to negotiate a better price. After the Artisan Tour the price will increase due to the ease of selling it from the tour. – (8″ x 4″ x 5/8″) 5.3 sq. ft. / box**Please note that kitchen image was the inspiration for this tile, and is not a Stonewood image. I was unable to find anything in the area with this aesthetic and decided to have it custom made. Currently 2185 sq feet remain. $65 a box. If you are willing to purchase the entire lot I am willing to negotiate a better price. SOLD IN BOXES OF 40 TILES EACH SHAPE. You would need one box of each for layout. So sold in 8.8 sq ft increments. – Retails for $36.00 a square foot. Huge deal if this is your style. Don’t forget to spring ahead today… We’re off to a slow start for today’s parade of homes. Up till now, we had visitors knocking on the door right at 12 o’clock. I’m starting to think The people have forgotten about daylight savings time. This is a view we haven’t seen for the past four weeks. An empty parade house! Attendance has been great and the response to our home extremely positive. Please come check it out. 5200 ft.², $1.3 million Dollar construction cost, five bedroom five bathroom house on Carman’s bay of Lake Minnetonka. Hand-hewn timber, natural stone and reclaimed clinker brick lend an authentic vibe to this Tudor-style estate completed by Stonewood, LLC;http://bit.ly/1G6j8F8. It’s a great weekend to visit the Parade of Homes! Featuring spectacular views of Carman Bay on Lake Minnetonka, this refined Cottage-style home has everything you’d expect from Stonewood. Not only can you enjoy long views through the gathering room and lakeside dining room, the master bedroom has a balcony overlooking the bay. A cozy office borrows views of the lake through the sun room, which opens to a sprawling main-level patio with fire pit. Homeowners also can take pleasure in a lakeside covered patio with an outdoor shower. A large office and exercise room are located above the garage, while the lower level features a sunken media room, guest room, bar and wine cellar. The Parade of Homes runs again this weekend! Come check out our Parade home in Orono on Lake Minnetonka. Land Planner: Yardscapes, IncDesign Statement:Taking full advantage of its beautiful Lake Minnetonka lot, this traditional Cottage-style home maximizes views without compromising privacy and is spacious while still maintaining the feel of a cozy cottage. Offering amenities such as a custom wine cellar, lofted office space, copper- soaking tub, detached carriage house, and bountiful outdoor living space, this home perfectly reflects the lifestyle of the owners in every detail. Since lake homes are seen from the water as much or more often than from the street, the aesthetic importance of the home’s lake side is elevated. Spatially, the home is laid out in a way that is practical and conducive to the current needs of the owners and also affords them the ability to age in place. Open from Feb 20th – March 20th, 2016. Thursday – Sunday, 12:00 – 6:00 PM. If built and designed well, they don’t last long (on the market, anyhow)! Former home of Jeff & Ethel Gustafson (Sven’s Parents and founders of Stonewood DB), and Luxury tour home from years ago. When Heather Dosch joined a Builder 20 Club during spring 2012, she and her husband, Kevin, were in the midst of transitioning their company, John F. Buchan Homes, from being a production and spec-home builder to constructing custom houses as well. “There’s a whole different way that you need to communicate and different systems you need to adopt when you’re going from building a house the way we want to build it to accommodating all of the unique requests—crazy or otherwise—for clients,” says Dosch, who is the CEO of the Bellevue, Wash., builder. She took the reins of her parents’ business a couple of years before joining the Builder 20 Club and says that while Buchan Homes had some built-to-order experience, having offered production-home customers the flexibility to customize, she noticed that the build cycle for custom projects was taking longer than expected. So she presented her dilemma to fellow builders at a club meeting, and their feedback convinced her to adopt a new policy that has since shaved 30 days off Buchan Homes’ build cycle. With natural exterior stone detailing, cottage-style windows and doors, and picturesque rooflines pierced by prominent gables, this gorgeous home in Wayzata’s Locust Hills neighborhood looks like it could’ve been plucked right from the English countryside. The use of wood and stone add country charm to the interior, evident in the exposed handcrafted timber trusses, wide plank hardwood flooring, distressed white kitchen cabinetry, ample built-ins, and massive double-sided stone fireplace in the two story great room; while modern amenities can be seen in the beautiful two-toned kitchen featuring stainless steel appliances, large granite center island, and Cambria countertops. bathroom 5,200-square-foot space: the homeowners’ personalities and interests shine through in the separate informal dining room (with distinctively bold red walls), expansive laundry/sewing room (complete with a fabric closet), built-in dog kennel, and second story music room/office, with a slid- ing barn door for added privacy. Other special features include an elevator, a Juliet balcony overlooking the main floor, and a sunny and bright east-facing master suite with enameled woodwork, luxurious fireplace, walk-in closet, and spacious mas- ter bath. The homeowners can polish their golf skills (and play, practice and compete on virtual championship courses) with a golf simulator on the lower level, near the bar. The space is filled with atmosphere, person- ality, and charm, perfect for entertaining friends and family or curling up with a cup of tea.